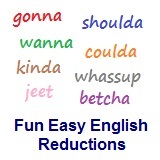 ﻿ Fun Easy English - new-american-english-reductions-reduced-words-topic-word-me-let-me-lemme. In this lesson you will learn the American English reduction lemme. Lemme know if you can come. Lemme think about your idea. Lemme talk with the president. Another commonly used American English reduction. Hey lemme know when you are finished. Reductions, such as lemme are not real words in English. Robyn Rihanna Fenty (born 20 February 1988) is a Barbadian singer, songwriter, and actress. Born in Saint Michael, Barbados, and raised in Bridgetown, she was discovered by American record producer Evan Rogers in her home country of Barbados in 2003. Throughout 2004, she recorded demo tapes under the direction of Rogers and signed a recording contract with Def Jam Recordings after auditioning for its then-president, rapper and hip hop producer Jay-Z. In 2005, Rihanna rose to fame with the release of her debut studio album Music of the Sun as well as its follow-up A Girl like Me (2006). Both albums peaked within the top ten of the US Billboard 200 and respectively produced the successful singles "Pon de Replay", "SOS" and "Unfaithful". This video is a good example of the usage of "lemme", and "wanna" English language reductions.